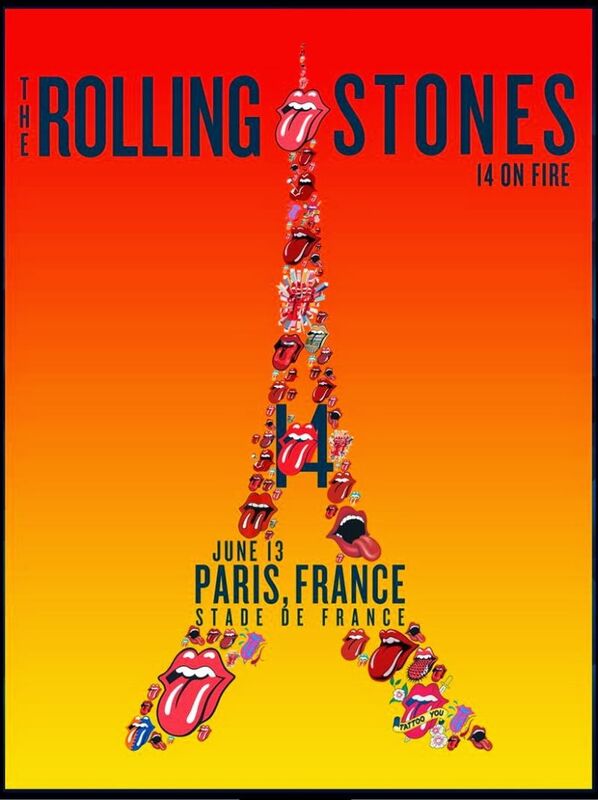 This thread is for live updates and comments regarding The Rolling Stones show at the Stade de France in Paris, France on 13 June 2014. Please tell us your pre- and post-show thoughts and comments here. Finally! Finally! After two visits to Paris with rehearsals and club shows, finally The Rolling Stones are inviting their fans for a date at the Stade de France tonight. Enjoy! Edited 2 time(s). Last edit at 2014-06-13 15:16 by bv. Edited 1 time(s). Last edit at 2014-06-13 18:00 by Bastion. this get's my pic as the best poster so far......anyone know what Vienna looks like yet? I got an email from oeticket with this pic about an hour ago. Maybe the Vienna poster will be something like this? Edited 2 time(s). Last edit at 2014-06-13 15:10 by 1962. Anyone at the stadium yet? Are the merch tents set up? Wow, Wow...I love that poster! Ming, if they have a t shirt with that, please, please get me one. Women's or Men's small. Have a terrific time everyone! BTW, have a great concert, everybody! Thanks for meantioning the start time Cristiano as well as the pictures (cool cup!. Now I know how long I've got before I can start looking for "show updates" as opposed to pre-show updates! Sounds like from 3:00pm EDT on I'm going to be worthless at the office again! Hope everyone attending the show has a great time. Those of us at home will be eagerly awaiting your posts and updates as you can get them to us! Have a good time, enjoy the show. This afternoon I spent a couple of hours in front of the hotel. A scalper was trying to sell a VIP ticket 300€. Half an hour later, an English guy came out of the hotel and gave for free a VIP ticket to a woman who was waiting on the other side of the street! Everybody was quite stunned. Nobody knew who he was. I saw Bernard Fowler and then Mick Taylor a few seconds later. I was right in front of Mick T. I put in his hand a cover of his own CD with a pen. He had quite enough time to sign. I asked: “please, Mick, can you sign?” He said nothing. He did not take the pen. He did not want to sign. He was sulking. This was the 2nd time that I approached Mick Taylor. Each time he was not at all friendly: no smile, no friendly word. All the time he is in a bad mood. All the time he is sulking. Will he enjoy to play with the Stones to-night? Wild Horses now soundchecked ! Have a great time everybody. Its getting hard to take, as i know i should be there for my first concert abroad for the stones. The last time it was cancelled i could take, but obviously its personall reasons this time, that i cant go. Will keep up with pictures and reports from the concert, while watching Spain V holland world cup match. Just hoping from a personall view that they dont play memory motel, it would really crease me if they play this tonight. No offence Georges,but a stranger putting something in your hand and expecting you to sign,is not the way to do it,in my opinion. Have fun everyone who's going! I imagine Mick has some witty french banter up his sleeves for the song intros. It would be great if they play it tonight. Taylor is grumpy all the time, I have witnessed this as well but it is his own time and ultimately his right not to be bothered. That would be great, oh, yes, Wild Horses! Have a fantastic time tonight, everyone!!! BTW, did you heard other songs they've rehearsed or just Wild Horses, onlykeef? Edited 1 time(s). Last edit at 2014-06-13 19:16 by glimmerkkp. Edited 1 time(s). Last edit at 2014-06-13 19:16 by Cristiano Radtke.